What do you think about having pretty flowers around your garden that will turn into something even more special? We think the idea for double the pleasure sounds divine, so we’re committed to bringing some fruit-bearing flowers into our garden this spring. There are many kinds of flowers that will provide sweet fruit for you to eat. You can grow these flowers in your yard, in hanging baskets, and even in vertical gardens on patios. 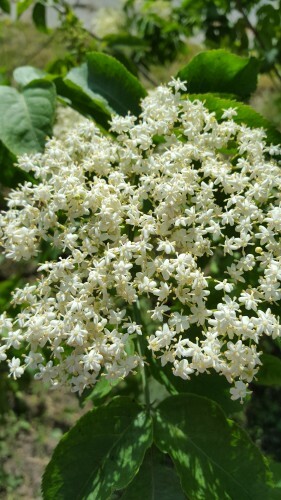 Consuming elderberries is becoming quite popular due to the fruit’s ability to help cure common illnesses. If you have a cold or flu, or another viral or bacterial sickness, you can turn to elderberries in whole, tea, or syrup form for healing. Elderberries are a deep purple fruit that develops from a small, star-shaped flower. This flower grows on shrubs, and it produces fruit in late summer and early fall. Flowers from plants in the apple genus put out fruits like cherries, raspberries, pears, and strawberries. Many people don’t realize that all of these fruits come from similar plants and flowers, but upon close examine the relation becomes evident. All of these flowers have about five petals, a flat appearance, and white coloring. Once in a while, however, you’ll find them in other colors due to crossbreeding and hybridization. You can grow these fruit-bearing flowers in the ground, in pots, or in small planters. Flowers in the peach subfamily give forth life to stone fruits like peaches, plums, and nectarines. These flowers product nectar and they have just one carpal, which is what turns the flower into a fruit (called a drupe). The carpal, or the female reproductive part of the plant, drops away after pollination and becomes the hard pit in the center of the fruit’s flesh. Grow these flowers in your yard or in a very large pot. Do you have any favorite fruit-bearing flowers that you keep around your house? If so, drop us a note in the comments below and let us know what sweet things you’re growing. What do you think about having pretty flowers around your garden that will turn into something even more special? We think the idea for double the pleasure sounds divine, so we’re committed to bringing some fruit-bearing flowers into our garden this spring.There are many kinds of flowers that will provide sweet fruit for you to eat. You can grow these flowers in your yard, in hanging baskets, and even in vertical gardens on patios.